Got some parties to go to during this holiday season or attending a special celebration in the near future? 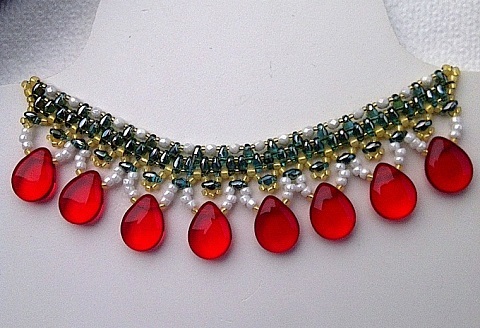 Why not spruce up your outfits with this lovely versatile Superduo Beaded Choker Necklace Tutorial by Italy based beader and reader, Ioana (also known as Luana). The video tutorial is in English so no translation is necessary for most of you. It is not just a pretty design. 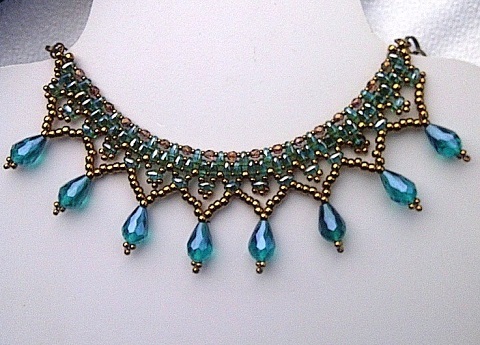 Ioana demonstrates how useful superduo beads are in beaded designs as they really add a great deal more possibilities. Small two hole beads have only been around for the last few years.You got to wonder what took them so long to come up with it! The tutorial is also noteworthy as she shows how different color schemes can really change the look of the design. So you can match outfits for any celebration not just Christmas. Observe how she adapted the design for side drilled large drops (above) and for vertically drilled ones. It is also a quick design because you can add metal chains for the back. A truly versatile necklace all round! By the way, Ionna sent me her smartphone (Blackberry) pictures so I wouldn't have to grab screen capture images from the video. My, smartphone cameras are super duper these days aren't they? Have passed it on to someone who loves doing this sort of thing. These necklaces are truly stunning. I love the pattern design and use of color. Great design. I love the calm inflection in your voice!